Well we have had a lovely few days. Was nice to have a break and spend some quality time with the kids. Was hard to keep away from the computer even at night time when the kids were sleeping but I somehow coped! Over the weekend we had a trip into town with friends to do shopping and join a fun Easter hunt, a girly mummy and Gracie movie night involving pic n mix and Harry Potter. 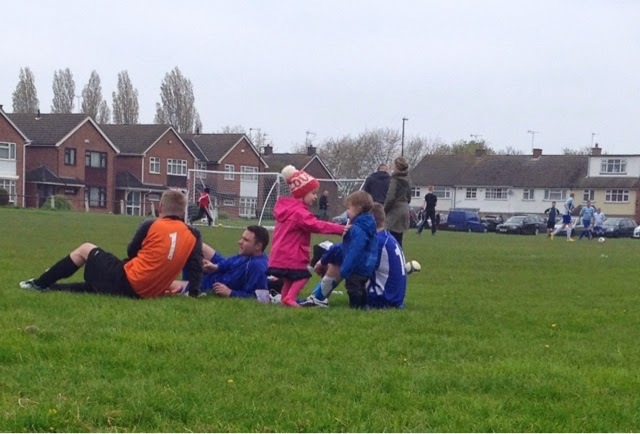 We watched Daddy play in a charity football tournament and had fun at the fun day events whilst there. Then yesterday the kids went to the park with Daddy and his friends while I did even more decluttering in the house. I feel so much better after having some family fun, getting time to relax by myself watching films in the evening and I'm really proud of all the stuff I managed to part with yesterday. Of course no Easter is complete without a silly amount of chocolate. The kids got well and truly spoilt and Andy managed to grab some bargain chocolate yesterday for us from work so we are not left out! 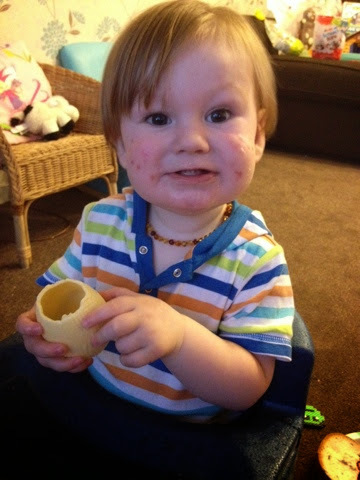 Zach actually got to eat his first ever Easter egg yesterday which he really enjoyed! How about you? What did you get up to this Easter?